The whole city of LA is such a gigantic studio that I couldn’t help noticing that Westwood in that weather at night would have been perfect to shoot a movie scene. I was told that different kind of trees are planted on different avenues around Hollywood and Beverley Hills so that studios can shoot “localised” scenes: let’s take this boulevard to pretend the action takes place in Italy because it has Cypresses or let’s shoot that Hawaii driving scene on that avenue with palm trees. When you think about it, this approach to cost-cutting is self-reinforcing: you shoot in LA because it is cool (you have the ghettos à la Training Day, the rich Westside à la Clueless, the beach à la Baywatch, etc. ), so LA is cool because it is on screens big or small all over the world and thus you want to shoot in LA which is great because that’s where you are. So, as far as cost-cutting goes, I hope some crew was smart enough to take advantage of the rain to shoot a nice scene and save on the “fake rain” budget to pay main actors their usual $ 20 million. Firewall comes to my mind: I saw it last week and it’s set in rainy Seattle (btw, it’s ok but the end is lame/rushed). After all, you only got five days of rain per year in LA – or so I was told. I am up to three now and I have blogged about each of them. Isn’t that pathetic of me – I leave London to blog about rain in one of the sunniest civilised place on Earth. Or perhaps it’s logical: when it’s sunny I am outside enjoying it (in the “blogging industry”, winter is considered “blog time”). Anyway, I’m going to sun-blog about San Diego and the Orange County soon. No it’s not SIN, although that was an easy guess for LA. Nice try. 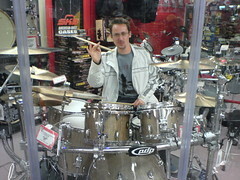 Originally uploaded by Guillaume Rigal. 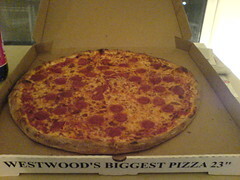 2 days ago, I came back from my jog to face the monster: the Westwood 23” pizza. Peter had just brought it home in its massive box and we ate it (not the whole thing) with a beer in front of TV. Note: I'm getting addicted to blogging with Flickr, that so convenient. Will you be the lucky iTunes customer buying the billionth song? My mother, a (fierce) economist analyst, is for sure already aware of this news which appeared in the FT and certainly glad about it: Europe’s three largest economies are doing slightly better than expected. So that’s good news for my Mom and Europe. Italian moms might not be so happy though as the 4th economy of the region is not doing that well (I am sure the Italians at London Business School are already doing their best to cheer their beloved moms – at least Manlio). Olivier had an interesting post a few days ago about Unilever releasing a new flavour of its Magnum ice cream dubbed “Cherry Guevara”. As usual, I had to post a stupid comment on his blog and now I just remembered that Ben & Jerry have this "Cherry Garcia" flavour (a play on word for Grateful Dead's fans I guess). Any lawsuit in the air? I don't think so: Unilever owns B&J! And to build on another “Karibu” post, we both are celebrity bloggers now: the two only MBA2006 cited on the latest school newsletter. The other guys just don’t get blogging… just kidding, I know there are more (hey Darren!). If only Olivier had some to say about Novartis in Indonesia in 1998 – the case from my International Business Strategy class on Tuesday for which a write-up is due. UCLA Anderson has these classes of 90min twice a week for certain subjects and this means 2 cases per week per credit. I much prefer the format we have in London. This, in brief, is why capitalism won. It's the only system that understands that we'd all like to change the world, but we are way too lazy for that sort of thing. Especially if there's ice cream around. Oh, there is Cookie Dough Vanilla B&J ice cream in the freezer. France, its administration and its political class are often blamed for not being up to date and not "connected" (digitally that is). However, the current majority party UMP has reportedly launched an aggressive online recruiting campaign which includes buying keywords on Google that are relevant to hot societal topics in the news. Even better, the UMP is apparently paying to advertise on requests containing names of opposition leaders. Of course, the Socialist Party wants to counterattack and is divided on an email suggesting to deliberately click on ads using its leaders' names to incur larger expenses to its rival. I guess these are the premise of a nice online bashing for 2007 elections. More in this article (in French). After driving Raquel to the airport, I watched the live DVD of Jet – Family Style. While it’s great to see them play live, while they really have great songs and while it’s always nice to see how a band works on stage (who does/plays what…), I found it a bit soft. Anyway, I had a good time and felt full of energy afterwards. Long-term energy to really do something serious with music (finish and record my songs properly and find ways to play live with friends). And short-term energy to go for a 50-min jog on campus with a quick stop to check that I had parked properly – I got a $45 fine yesterday for parking on the wrong side of Veteran as I ignored that they were cleaning the east side on a different day (Thu.) than the west side (Fri.). I will of course apply for an appeal – that got me out of a bad parking fine in UC Berkeley two years ago. Running was ideal to burn the Mc Do’s calories… as well as the pizza-related ones accumulated since last Tuesday when I entertained Raquel on a tennis court. Now it’s time for a merited and necessary shower – I hope to post this soon afterwards as the network is not playing ball at the moment. Important note because I don’t want to spoil the LBS French Club reputation: I am not the sport-crazy (nazi?) type of MBA – marathon running, gym freak… well… you know what I mean :). I usually run faster and no more than 30 minutes. I think the last time I ran that long was the time I decided to jog to St Paul during my first weeks in London in 2004. So, once every 18 months. The French Club honour is safe. There is a high degree of correlation between the RAIN (the rain is extremely rare is SoCal as one might expect but when it rains, it actually pours) and Raquel leaving LA. In December I had to drive her from Glendale under buckets of rain and today, we encountered the same situation with the rain starting as soon as we left Westwood to only end at LAX. We however enjoyed a nice weather (not great but nice enough) to “ramble” (too much Led Zep listening in the car) in Santa Monica on the beach and on the pier watching the Pacific, the birds and the guys fishing. Reaching Los Angeles Airport was an Odyssey and I really thought we were not going to make it. Monday is President Day so I guess that all LA decided it was the week-end to move to the opposite part of town. No point taking the 405 and after trying some small streets we opted for Sepulveda and some patience… and we managed to make it in time to share a rapid Mc Donald’s Chicken Select (I’m gonna miss that one if they don’t roll it out in London for an occasional McDo) and then we parted. To be fair, the first part of the journey was more like the Iliad - my Odyssey was driving back to Westwood as the 405 was also literally stopped going north. So Sepulveda it was again, but much faster this time. I follow some feeds from the FT in my Thunderbird and this series of news amused me last week. I just wanted to share. Too bad there was nothing about British Airways or Abba in the news as well.